How Can My Senior Loved One Benefit from Online Dating? Many seniors receiving Harrisburg home care may not be comfortable with computers, but using technology to find romance or make new friends may be worth the trouble. 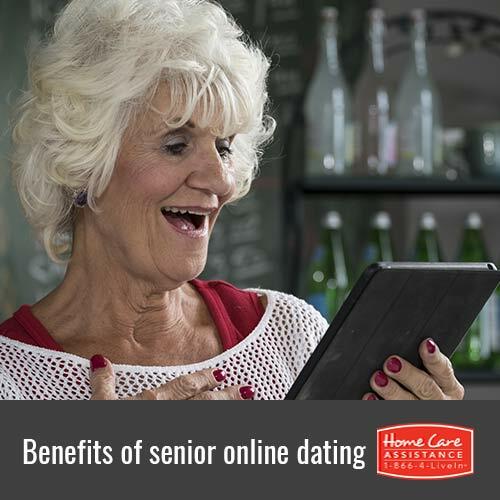 Your elderly loved one can discover a wealth of mental and emotional benefits when meeting new people through online dating. With online dating, there’s a strong likelihood of compatibility. Your loved one can find other seniors with comparable interests and goals because search engines can analyze member profiles to determine suitable matches. The best dating sites use filters, ensuring a respectable membership, which means your loved one is likely to meet upright individuals during his or her search. During first contact, communication can be awkward. Seniors may hesitate to share emotions and beliefs, uncertain of how their dates will respond. When people interact online, they tend to reveal more about themselves than they might in person. They also experience less embarrassment when divulging thoughts and feelings. Shyness can hinder the ability to reach out to others. For seniors lacking confidence or self-esteem, the Internet can be the ideal means to initiate a relationship. This is especially the case with seniors who feel self-conscious about their bodies. With online dating, your loved one can go beyond physical attraction, connecting to others on a deeper level. The decision to date someone can be based more on who he or she is, rather than appearance. Meeting new people through online dating can help relieve social isolation. With age, your loved one’s social circle can shrink for many reasons, including retirement, physical disability, and loss of loved ones. With online dating, your loved one can be linked to a large community and stave off loneliness. Just being socially active through online dating can help boost your loved one’s brain. A study published in the American Journal of Public Health showed seniors who were socially active had sharper minds than those who were reclusive. Study author Lisa Berkman reported, “social interaction keeps you mentally engaged.” The American Academy of Neurology evaluated the relationship between dementia and socialization, concluding that socially active seniors are less likely to experience cognitive decline. Brain imaging also shows neurological differences between a person who is alone and one who has support. Stress-related brain activity subsides during positive social encounters. Some seniors may not be interested in forming new relationships online. However, if you think your loved one would benefit from regular companionship, Home Care Assistance can help. We offer live-in and part-time care in Harrisburg, and our caregivers are available 24/7 to provide the emotional support your loved one may need and help with a wide variety of daily tasks. For more information, call one of our friendly Care Managers at (717) 540-4663 to schedule a free in-home consultation.